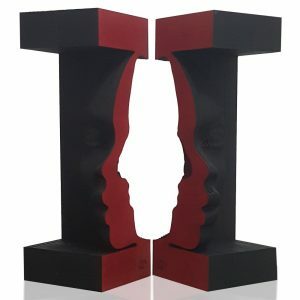 The African-American history museum in the Parramore neighborhood will be auctioning off Restrepo’s mixed-media sculpture “Yemoja” on Thursday, April 5 (5:30 p.m., 511 W. South St., Orlando, wellsbuiltmuseum.com). Proceeds will be used to digitally archive records held by the museum, which primarily houses memorabilia from the Civil Rights Era in what used to be the Wells’Built Hotel. The sculpture, which will be on display at the museum until the auction, depicts the patron spirit of women to the Yoruba people of Nigeria. Viewing the piece from different angles changes its color and details. Restrepo, 33, has had works placed nationally and internationally from Chicago to Latin America to China. The sculptor spoke about his connection to the museum, the inspiration behind this sculpture and the relationship between artists and institutions. Questions and answers have been edited for length and clarity. 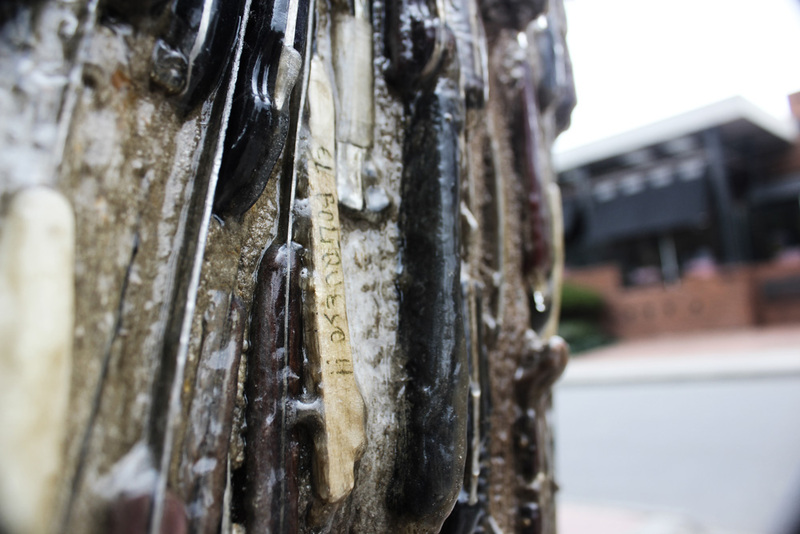 Question: What prompted you to donate a piece to the Wells’Built Museum? Answer: I have always been interested in ways to preserve history and Orlando has a growing museum that highlights a time in which Dr. William Monroe Wells decided to drive out hate with love and created an amazing space that promoted culture and entertainment and lodging during times of segregation for the African- Americans that were in Orlando … The love and care that is put into the Wells’Built Museum is seen from the moment you walk in and it is a place that I am sure that will grow a lot in the next few years. So, after a visit I made to the museum with my best friend Mateo Blanco, and a long talk about the importance of the place, we wanted to help the museum to raise money. So I donated the piece and Mateo, who is also an artist, has been helping me arrange the auction. We hope that this auction will also make more people and artists involved in the museum. Q: How did you choose Yemoja and the Yoruba culture as your subject? A: I have a series of sculptures that are like totems that are modular and you can play with them and they change meaning depending on the way you place the different elements. That series is of forgotten gods and I try to bring their history and their teachings to the new generations. 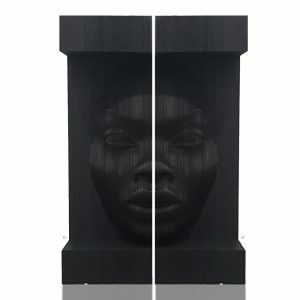 For this artwork, that was conceived specially for the Wells’Built Museum, I chose Yemoja that is the same god that in South America comes as Ayeyamá and it is the perfect way to unite the African-American and the Latin American heritage together. The sculpture in a way represents what the museum is for Orlando’s African-American heritage, a caretaker of its history and a bringer of culture for the city of children and magic. Q: What is your usual creative process? A: The initial idea sometimes comes from an old song or classical music piece. Sometimes they come from prayers or places that I find significant in one of my travels. Then I like to go to a process of oversaturating my brain with information, so I investigate other works of art of the same subject. I dive in to the culture or language of the place, I start eating the food of the period or place, I look for tales and writings in old dusty books and then I let my brain rest for a few days or weeks. Then I usually sketch during flights. (I think the best place for quick sketching is a plane, because I am afraid of flying so it makes it a life and death situation in which I have to deliver.) Then I leave those sketches to rest for a few years and revisit them to see how the new me sees those ideas. It is kind of [like] working with a partner that is a few years apart. I have some ideas that take as long as 10 years to come, because I wait for the time where everything clicks. That is what happened with the Wells’Built Museum sculpture. It just clicked, and when my work finds a way to help an organization it is when I find what I do more meaningful. Q: You’ve done outdoor installations, such as the one for China in the Urban Greenway. 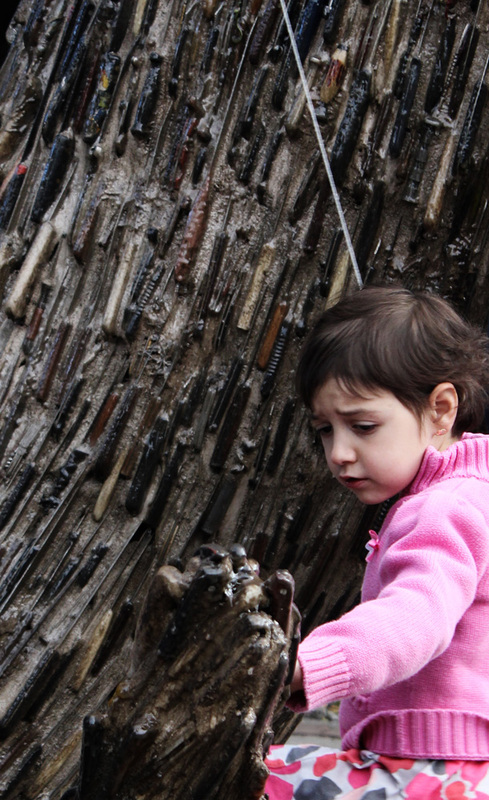 What is the significance of sharing art and specifically sculpture outside? 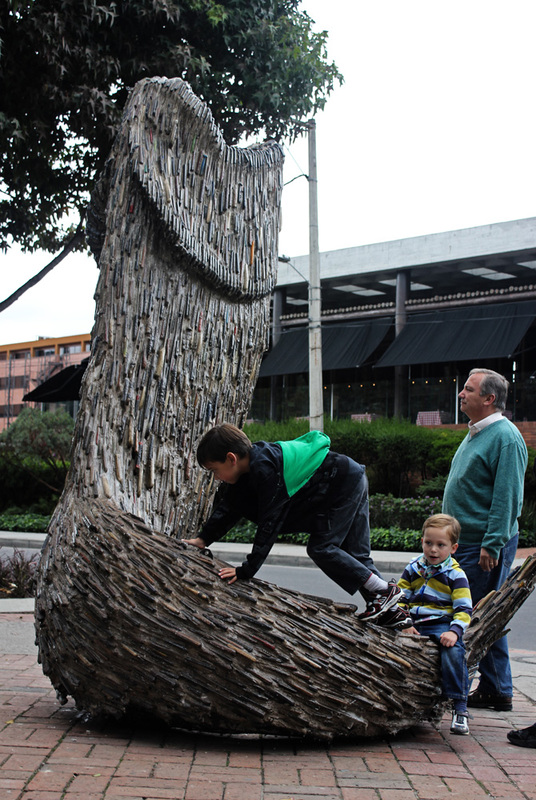 A: Outdoor sculptures are a great way to interact with people. In fact, an outdoor sculpture should interact with people and its environment. I like people to be humbled, to feel small yet empowered at the same time. So I think that more places should have huge sculptures, not in order to make the world a museum, but to bring that sense of wonder that is being lost living life through a computer or phone screen. 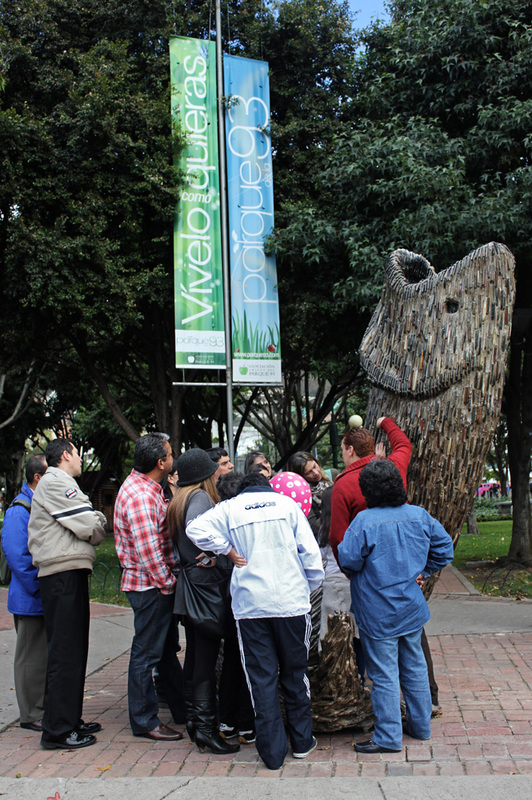 An outdoor sculpture brings people together, they are great meeting places and even better places to propose. They are pieces that help you remember important moments of your life. Q: Do you believe artists have an obligation to support art institutions or should it be the other way around? A: I like to support institutions because I love to help. Since I was a kid, my mother and father always told me the importance of giving back. I have been doing it as I am able to. I hope I could do more. Art is not an easy career and if you are serious about it, you have to be more disciplined than an accountant or a lawyer in order to succeed. There is always that trap of believing that someone will see you for who you are and invest everything in you, but that is not the rule; that is the exception. The best thing to do is to work incredibly hard, and if you can help an institution, that is amazing and if an institution helps you out, be extremely thankful, because those opportunities don’t happen often. To give a straight answer, I think that he who has the means has an obligation to help. This life is all about sharing. The exhibit is taking place from October 7 to 28, 2011 honoring the blue planet with the participation of 70 Colombian artists who rendered their “fish” creation to be exhibited and then auctioned off on November 2nd through Christie’s Latin American Art Auction. 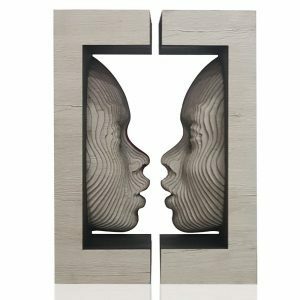 The youngest of this large group of artists is Joaquin Restrepo who ranks among the top 10 artists of “Fundacion Corazon Verde” with sales exceeding $150,000. 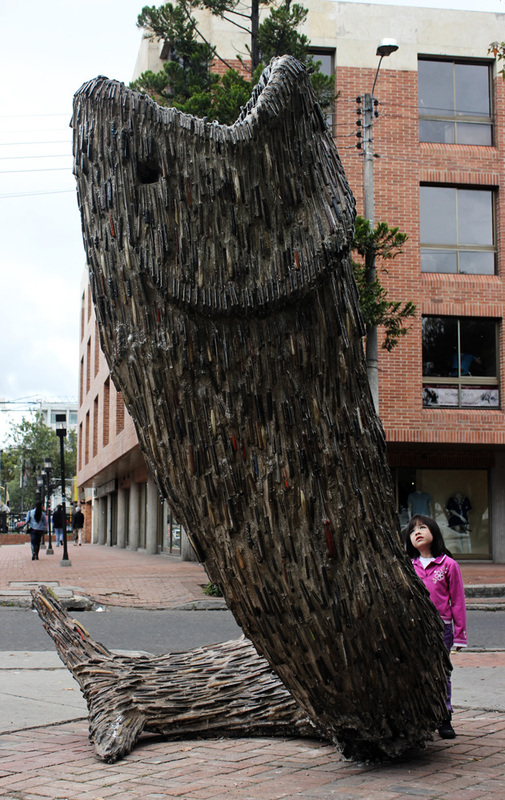 Restrepo is exhibiting a large 3.20 meters high sculpture entitled “Ichthys,” a sculpture made with knives confiscated by the Colombian Police Department which tell an urban story that fascinates and educates the public and children alike. “These are real knives which have hurt other people. I first started this project taking photographs of the knives, some of them beautifully crocheted; I asked myself, what were they thinking when they were doing it?,” said Restrepo from Shanghai in a previous WUM exclusive interview. 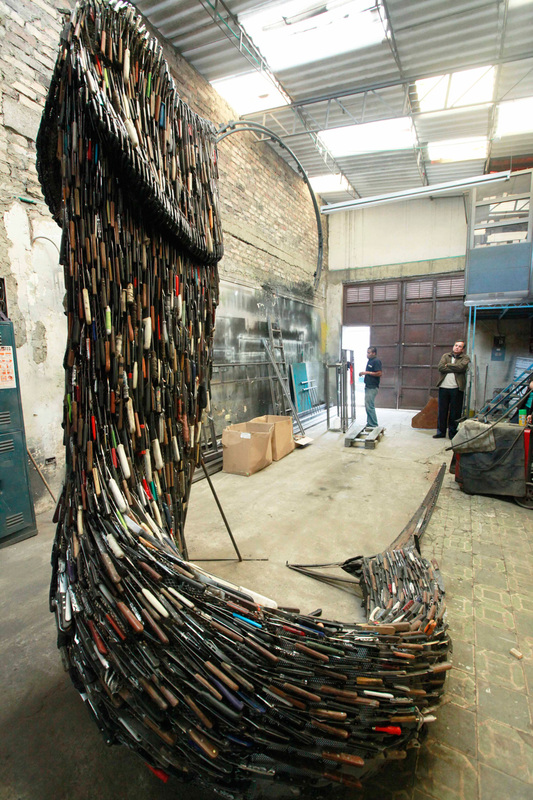 “The fish will represent the transmutation of violence with its deadly weapons transformed in a life form sculpture,” added Restrepo.